Nainital Bank Limited has given a notification for recruitment of 30 Clerk vacancies. Eligible candidates may apply online from 15-10-2015 to 10-11-2015. Age Limit: Candidates age should be between 18-27 years as on 30-09-2015. Age relaxation is applicable as per rules. Educational Qualification: Candidates should possess Graduation/ Post Graduation with minimum 45% marks and knowledge of Computer Operation. Application Fee: Candidates have to pay Rs. 800/- (Rupees eight hundred only) (Non- Refundable) through NEFT at The Nainital Bank Limited, NTB Recruitment A/C Clerks-2015 by means of a Payment Challan available in the Bank’s website and pay the application fee in NEFT Account No. 0011000000000658, IFSC Code is NTBL0NAI001. How to Apply: Eligible candidates may apply online through website www.nainitalbank.co.in from 15-10-2015 to 10-11-2015. Step 2 - Click on the APPLY NOW link of recruitment in the page. Step 3 - Click on the Registration button in the top right corner of the page. Step 4 - Fill your personal details in the page and click submit/next button. Step 5 - In the next page fill all qualification details, professional details. Submit the data. A provisional registration number and password will be generated by the system and the same shall be sent to the candidate through e-mail of the concerned candidate. Step 6 - Your Registration is completed. Step 7 - After making payment of fee through NEFT (only mode of payment of fee), open the link http://www.nainitalbankcareer.com/Login.aspx . Step 8 - Enter Registration Id, Password in the appropriate boxes, sent by the Bank to the candidates’ e-mail Id and then login. Step 9 - Enter details of payment of FEE (NEFT) in the payment page carefully such as Transaction No., bank name and date of payment. Then Click Next. Step 10 - Browse and Select the location where the Scanned Photograph / Signature file has been saved. Select the file by clicking on it. Then Click the ‘Upload’ button. Ensure the Guidelines for scanning and uploading of Photograph & Signature. Step 11 - After clicking submit, the process of submission of on-line application will be completed and preview of all details will be shown. Save the page for further references. Starting Date of Online Application: 15-10-2015. Last Date for Submission of Online Application: 10-11-2015. Applications are invited for appointment to the post of Staff Assistant and Manager (Scale –I) for filling up the following vacancies by direct recruitment, through IBPS. Qualification (as on 01.08.2015): Graduation with 60% aggregate marks or Commerce Graduate with 55% aggregate. Age (as on 01.08.2015): Above 18 years – Below 28 years i.e. candidates should have been born on or after 02.08.1987, but not later than 01.08.1997. Selection Procedure: The selection of the candidates shall be made on the basis of the Online Test/ Examination and interview. Opening date for Online registration of application: 07.08.2015. Closing date for Online registration of application: 19.08.2015. Date for Payment of application fee: 17.08.2015 to 19.08.2015. Tentative date of online test for Manager (Scale-I): 08.09.2015. Tentative date of online test for Staff Assistant: 10.09.2015. Sarva UP Gramin Bank invites applications for the post of Officer in Middle Management Grade (Scale III), Officer in Middle Management Grade (Scale II), Officer in Junior Management (Scale I) Cadre and Office Assistant (Multipurpose) who have been declared qualified at the Online CWE-III for RRBs conducted by IBPS during September 2014. Pre- Requisite Qualifications: Candidates who have been declared qualified in the RRBs-Online CWE conducted by IBPS in September 2014. How to Apply: Candidates are required to apply online through Bank’s website. Last Date for Online Registration: 20.08.2015. 3. The purpose of which of the following type of advertising is to create repeat purchases? 4. ______ is the process of evaluating each market segment's attractiveness and selecting one or more segments to enter. 7. Entry of laggards is in which stage of PLC (Product Life Cycle)? 8. ______ factors are the most popular bases for segmenting customer groups. 11. According to the American Marketing Association, which of the following is marketing of products that are presumed to be environmentally safe? 12. One of the following is not included in the 7 Ps of Marketing. Find the same ______. 14. A call marketing terms means? 21. The biggest or greatest amount of involvement in a foreign market comes through which of the following? 26. In terms of execution styles, a family seated at the dinner table enjoying the advertised product would be an example of which of the following types of advertising? 28. ______ has contractual authority to sell a manufacturer's entire output. customer to the store for a bargain that is out of stock, or running rigged contests. 33. In terms of special product life cycles, a ______ is a basic and distinctive mode of expression. Age (As on 01.08.2015): Minimum: 20 years; Maximum: 28 years. How to Apply: Candidates can apply online only from 11.08.2015 to 01.09.2015. Mode of Payment: Candidates have the option of making the payment of requisite fees/ intimation charges through the Online mode only. Utkal Grameen Bank, Head Office, Bolangir invites applications for the post of Officer in Junior Management (Scale-I) cadre and Office Assistant(Multipurpose) from who have been declared qualified at the Online CWE for RRBs (CWE-III) conducted by IBPS during September/ October 2014. Pre- Requisite Qualifications: Candidates who have been declared qualified in the RRBs Online CWE-III conducted by IBPS in September/ October 2014. Last Date for Online Registration: 05.08.2015. Baroda Uttar Pradesh Gramin Bank invites applications for the post of Office Assistant (Multipurpose) from who have been declared qualified at the Online CWE –III for RRBs conducted by IBPS during September/ October 2014. Pre- Requisite Qualifications: Candidates who have been declared qualified in the RRBs-Online CWE conducted by IBPS in September/ October 2014. Recruitment process for selection of personnel for Credit Officers and Security Officers in Middle Management Group (MMG), Scale II (Specialist Category). Qualification: Graduate with Full time MBA/ PGDBM in Banking & Finance with aggregate of 60% Marks. Qualification: Ex-Commissioned Officers of the Rank of Captain or above from Indian Army with minimum 5 years’ service or equivalent rank from Air Force, Navy and Para Military Forces. How to Apply: Candidates can apply only online only from 17.07.2015 to 01.08.2015. Closing Date for On-line Registration: 01.08.2015. 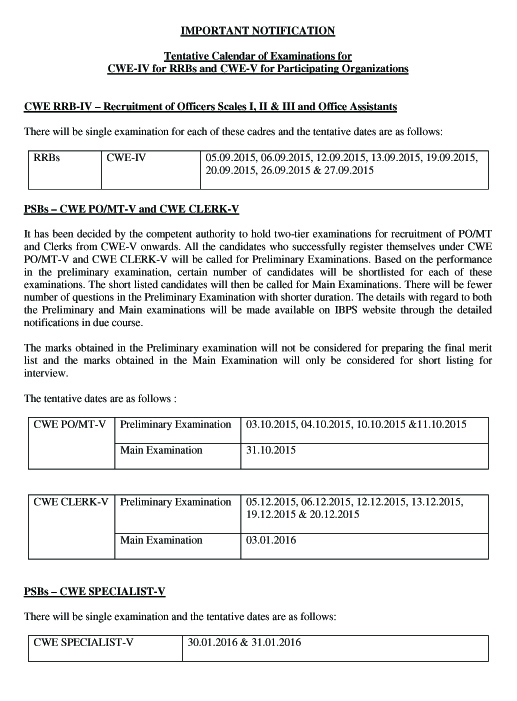 Tentative Date of On-line Examination: 04.09.2015. Canara Bank invites applications for recruitment to the post of Manager-Security in Middle Management Grade Scale-II. Age limit: 25 – 40 Years. Selection Procedure: Basis of Short-listing and Group Discussion and/ or Interview. Last Date for Receipt of physical application: 10.08.2015. Copyright © 2012 BANK EXAM QUESTION PAPERS - All Rights Reserved. We have taken every care to see that copyrighted material (content) is not included in this website. Still if there is any such inclusion of copyrighted material by accident or by mistake, the concerned authorized copyright holders may intimate at rk51027@gmail.com. On receipt of which we assure that we would remove that material if it is proved to be breach of copyright.